DSC_1300 a photo by ptelford on Flickr. I probably paid more for this than Homer Simpson makes all year at the nuclear power plant, but boy was it worth it. 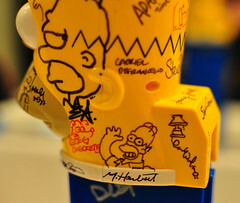 Doodles courtesy of the Simpsons animation staff. See more over at flickr.